Volunteer opportunities are still available! Cine Las Americas will be hosting a second volunteer sign-up and recruiting meeting on Tuesday, April 13 at the Mexican American Cultural Center (600 River St, Austin TX 78701). This new recruiting meeting will take place in the performance room, upstairs at the Mexican American Cultural Center. Volunteer sign-up will begin at 6 PM and volunteers will then proceed to choose available working hours. Volunteers will be able to choose their shifts on a first come-first served basis. A brief orientation meeting will take place in groups after individuals sign in that same afternoon. Through the years hundreds of volunteers have dedicated their time to help make the Cine Las Americas International Film Festival a success. From helping at the box office, to assisting with production, operations and much more, volunteers are major part of the Festival. Venue Managers are organized team leaders who can keep to a tight schedule, work well with a team of volunteers, and provide a superior experience for festival attendees. Experience with customer service, managing event venues, box office and staff preferred. Responsibilities include managing all box office operations including ticket sales, will call lists, merchandise sales, survey administration, audience counts, box office reports, and directing a staff of volunteers in order to provide a seamless experience to film festival audiences. Venue Managers are responsible for keeping the screening schedule on-time, working closely with the Production Manager. TIME COMMITMENT: Volunteer Meeting on Tuesday April 6 at the George Washington Carver Library. Production meeting on April 10; Minimum of 12 hours of scheduled venue management time at assigned [[Venues]] from April 21 to 29; 10 hours between May 3 and 7 for re-cap and wrap-up. 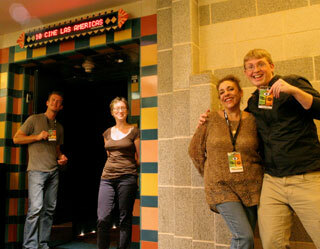 Box office is the largest group of volunteers at the festival. This group will include an average of 30 individuals who will be the face of the festival to the audience. Box office volunteers have the opportunity to experience the festival day by day, getting to know other motivated individuals with keen interests, and become an essential part of the festival staff. -Answering general questions from the public. Scheduling of available times will be made on a first come first served basis at the Volunteer Recruiting Meeting on Tuesday April 6 at the George Washington Carver Library. Volunteer sign-up will begin at 5:30 PM and volunteers will then proceed to choose available working hours. A brief orientation meeting will take place from 6:30 to 7:30 that same afternoon. Help make the festival happen! Individual should have excellent communication and organizational skills, thrive in a rigorous, high-energy, deadline intensive work environment and possess adaptability, follow direction well and problem-solving skills. Event production and set-up, driving, customer service and other duties to be assigned. Spanish/English bi-lingual a plus. Reliable transportation required. TIME COMMITMENT: April 12 - 30. Part time availability required. Applicants must be available during evening hours and weekends in the days leading to the festival. Friendly, reliable, organized, and schedule oriented. Own reliable transportation with valid insurance. Valid Texas Driver’s license. Bilingual English/Spanish a plus. Technical assistants are in charge of video projection at the festival venues. Knowledge of different professional video formats, experience in video projection, ability to perform in a team oriented environment and follow direction, able to perform calmly and troubleshoot technical issues under pressure. TIME COMMITMENT: One orientation meeting on Saturday April 17, and a minimum of six hours scheduled to work at festival venues between April 22nd and April 28. * Photographing key events, workshops, and programming during the festival. * Planning all shoots and the general concept of the finished product. * Collect names of artists, delegates, and guests that are photographed. * Sending photos to Festival staff each night in j.peg format. * Access to professional grade photographic equipment. * Availability to fulfill a production schedule. * Filming key events during the festival, including receptions, question and answer sessions, interviews, press conferences, panels, and special events. * Interviewing artists, delegates, and guests. * At least one year of experience in video production (shooting, interviewing and editing) (sample of work will be considered an asset). * Have access to own professional grade video camera and audio recording equipment. * Availability to fulfill a coverage schedule during the event.